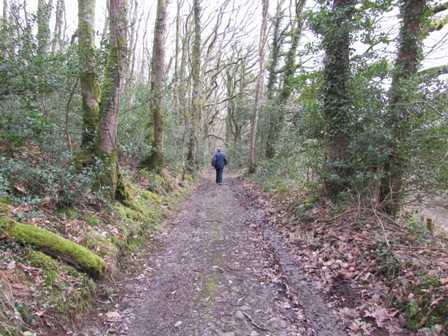 This NNR is part of the largest block of ancient woodland in West Wales. It is a beautiful reserve full of interesting flowers and plants, and alive with birdsong in the spring and summer. The site is owned and managed by the South and West Wales Wildlife Trust. 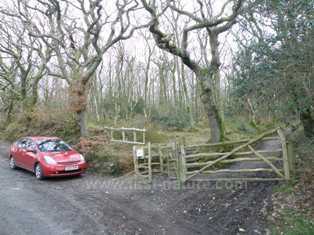 The nearest village to this nature reserve is Felindre Farchog, which is on the A487 Cardigan to Fishguard road, but the turn from Felindre Farchog onto the road for the nature reserve is a difficult one, and the lane has a ford which varies in depth depending on how much it has been raining just before your visit! A better approach is to turn right from the A487 (if travelling from Cardigan towards Fishguard) into a small unsigned lane which leads to towards Pont-gareg and eventually to Felindre Farchog. There is a picture of the road junction on the left. It is the turn after the one which goes down towards Moelgrove. Once on the lane just keep going straight, ignoring all turns off the lane, and the entrance to Pengelli Forest will be on the left as you drive down a steep hill. There are good tracks throughout the NNR, but some are steep and rutted and not suitable for wheelchair users or for people with prams or pushchairs. There are no facilites at the reserve other than an information board and a shelter just inside the reserve. This woodland was once a valuable asset to the local population, who cut down the trees and sold them as firewood. Part of the reserve has gentle slopes and easy access, and the tree species there include Ash, Alder, Aspen, Wych Elm and Wild Cherry. The Pant-Teg sector has steep rocky slopes covered mainly with Sessile Oaks and Birches. Underneath the woodland canopy is Hazel, Holly, Honeysuckle, and in places, a dense carpet of Bilberry. Other interesting trees include Midland Hawthorn, and also native Crab Apple. The wildflowers are plentiful. 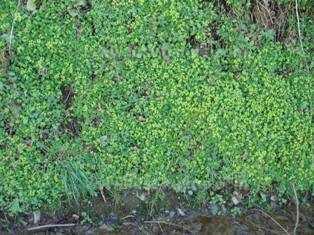 In February Golden Saxifrage (Chrysosplenium oppositifolium) is at its best and cascades down wet banks close to watercourses. Not long after come the Primroses (Primula vulgaris), Dog Violets (Viola riviniana) and Wood Anemones (Anemone nemerosa), and slightly later the intruiging Town Hall Clock (Adoxa moschatellina) - this tiny plant is hard to spot, but in groups of five the flowers form a structure like a miniature Big Ben. Water Avens (Geum rivale) is another lovely wildflower to look out for early in the spring. One of the things that makes Pengelli Forest NNR really special is that it is the only known breeding site in Wales of the rare Barbastelle Bat (Barbastella barbastellus) which, along with seven other bat species, roosts and hunts for insects in this lovely woodland. This is also a great place to see birds, and many typical woodland species are seen in Pengelli including Chiffchaffs (Phylloscopus collybita), Redstarts (Phoenicurus phoenicurus), and Wood Warblers (Phylloscopus sibilatrix). Sparrowhawks (Accipiter nisus) hunt there and Buzzards (Buteo buteo) can be heard crying overhead. The woodland is home to interesting invertebrates such as the Oil Beetle (Meloe proscarabeus). This wingless beetle was originally classified with lice because it looks so much like one, but its name comes from its ability to discharge evil-smelling yellow blood as a defence mechanism when threatened. The Dark Bush Cricket (Pholidoptera griseoaptera) is found in Pengelli Forest, and it is one of the first crickets to be heard in spring - often as early as April. Purple Hairstreak butterflies (Quercusia quercus) and the Silver-washed Fritillary butterfly (Argynnis paphia) are present in the summer, although the Purple Hairstreak, which spends most of its time in the treetops, is seldom seen. 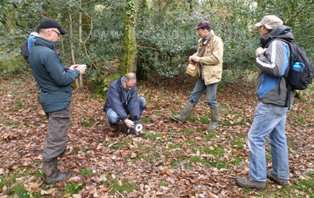 A host of mammals - Badgers, Foxes and the Dormouse (Muscardinus avellanarius) included - live in Pengelli Forest NNR as do frogs and newts in the wetter areas. The Dormouse is becoming rare, but Pengelli Forest with its supply of Hazelnuts to eat as well as Honeysuckle (it uses the bark to build its nest) suits it very well. Occasionally Slow Worms (Anguis fragilis) make an appearance, and if you are very still and quiet, you may also spot a Common Lizard (Lacerta vivipara) in warm weather.